I’ve noticed a serious lack of cheese related content on this blog and I am going to remedy that right now. Now I’m not your every day type of cheese connoisseur by any stretch of the imagination, but I know what I like and I like cheese. For example I am not responsible for this blog found here http://cheeseconnoisseur.blogspot.co.uk/ but whoever was knows his cheese, so much so that I want to be him. But I digress, we’re here to talk cheese. What is cheese to me? An excellent topping on pizzas, a good filler for a sandwich, a superb food to eaten alongside olives and other such like nibbles. All of these and more, all of these and more. But cheese means more to other people, other people like Troy Landwehr. For some people cheese isn’t just for eating, it is a way of life. 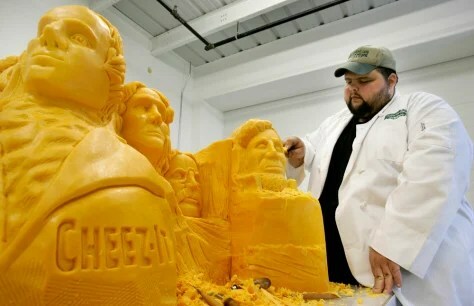 That is awesome you may think, this man has carved Mount Rushmore out of a gigantic block of cheddar cheese. But you’d be wrong, it isn’t awesome. Something worries me, what kind of cheddar is that exactly? That glowing neon yellow cheese of plasticness? Can you imagine the guy doing this with mature English cheddar? That champion of cheeses would crumble all over the place and it would be less Mount Rushmore and more Mount pile of crap. That looks suspiciously like processed American cheese, a blasphemy against Cheeses if ever there was one. He didn’t carve that, he poured that plastic gloup into a pre-fabricated mould. This entry was posted in Cheese, Dillon and tagged American cheese isn't cheese, Cheese, Cheese carving, cheese police, Cheese sandwich, Dairy, Dillon. Bookmark the permalink.